When 5-year-old Bella complained of incredible pain in her tummy, her parents were worried right away – Bella’s not a complainer. Her dad, Travis, brought her to the emergency room where doctors assured them it was just constipation. Weeks later, Bella’s mom, Tabitha, noticed a hard lump in Bella’s abdomen, so at Bella’s next checkup, she brought it up to the doctor. “I could tell by the look on the doctor’s face that something wasn’t right,” Tabitha said. The next day, Bella had surgery so doctors could get a piece of the mass and determine what it was. After the surgery, an oncologist sat down with Tabitha and Travis to give them the news that would change their lives. Bella had hepatoblastoma – liver cancer. “My heart just dropped to my feet and I had tears streaming down my face and a lump in my throat – we just lost all sense of time in that moment,” Tabitha said. What came next was a flurry of x-rays, blood tests and other procedures. Bella had a port placed in her chest, and began her first round of chemo just a few days after the diagnosis. Tabitha says that the hardest thing about Bella’s cancer journey so far is watching the multitude of tests and procedures become her daughter’s new normal. Since being diagnosed, Bella has had procedure after procedure, including a liver transplant that took doctors 11 hours. One thing that makes everything little less scary is Bella’s doll, Jessie. Jessie has had every poke and procedure that Bella has had, and she goes with to every appointment. She even has a mini-ostomy bag to match Bella’s – but Jessie’s holds M&Ms, as Bella will tell you with a giggle. Tabitha says having Jessie helps Bella understand what’s going to happen and makes everything a little less scary. Bella is a girl’s girl – she loves dressing up, the color pink and the TV show Peppa Pig. Her laugh is so infectious that she’s won the hearts of many doctors and nurses. But Tabitha’s favorite thing about her giggly, upbeat daughter is her compassion for others. No matter what she’s going through, Bella wants to check in with her family and friends to make sure they are all doing well. 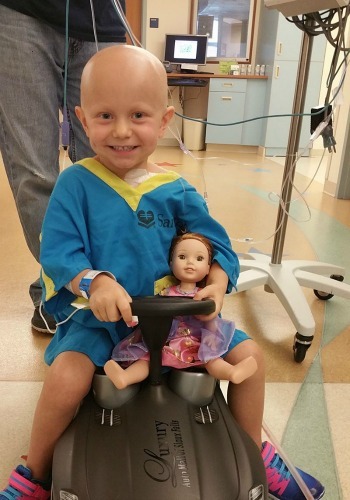 This difficult journey has brought Tabitha’s attention to childhood cancer as a whole. She’s amazed and frustrated by what she’s found – that research into treatments for cancers like Bella’s doesn’t have enough support to move forward. Because of the harsh treatments Bella has received, she has needed two liver transplants, both major surgeries with a lot of risks. The donor for her second new liver was an 8-year-old boy, whose family gave the ultimate gift in their time of grief to help Bella live. So far, her new liver is functioning well, and she and her mom were able to finally leave the hospital and go home to Bella’s dad and brother. The road in front of Bella and her family is still unclear, but their old “normal” is in the past. Bella will be on certain medicines for the rest of her life to make sure her body doesn’t reject her new liver, and she’ll have regular labs and appointments for the foreseeable future. Tabitha’s hope for Bella is that she can do the normal things kids her age should be doing –starting kindergarten and playing with her brother and friends, free of worry and pain. But she also feels like Bella has a unique path in front of her.